WBC world heavyweight champion Deontay Wilder says there is “no question” he will fight Tyson Fury this year. The American, 32, argued with Fury’s team at Friday’s weigh-in for the Englishman’s bout with Francesco Pianeta in Belfast on Saturday. Wilder’s manager Shelly Finkel told BBC Sport the bout will be in “November or December in New York or Las Vegas”. 5 live boxing podcast: Fury v Wilder – a ‘once in a decade’ super fight? Pianeta will be Fury’s second opponent since the former unified world heavyweight champion took a two-and-a-half-year break from the sport as he battled depression and was given a period of ineligibility by UK anti-doping. 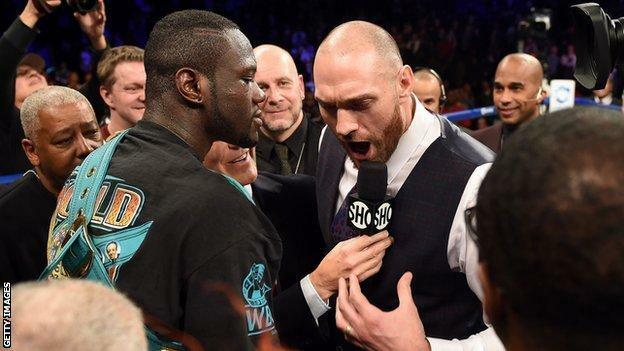 Wilder will be ringside for Saturday’s bout, and told BBC Sport he loved the “energy” of Friday’s weigh-in as it provided him with a view as to what a bout with Fury would be like. Prior to his break from the sport, Fury held the WBA, WBO and IBF versions of the world heavyweight title, all of which now belong to Britain’s Anthony Joshua. A bout between Wilder and Joshua has been mooted for several months but drawn-out negotiations have failed, with the Alabama fighter stating he is now not interested in facing Joshua at Wembley in April, despite a date at the stadium already being in place. “I have no words for Joshua, it’s solely on Fury,” Wilder told BBC Sport. “Joshua is old news, there’s a new kid in town – Tyson Fury. Fury goes into Saturday’s bout at Windsor Park with a record of 26 wins from 26 fights, while Wilder is unbeaten in 40 contests. This is the third-biggest fight that could be made. Joshua v Fury would be massive for a UK and global audience, then Joshua-Wilder and then this. Interestingly, bookmakers have already marked up prices for Fury-Wilder and they believe that Fury is odds on. They believe he is a hot favourite. They are pricing it like that largely due to Wilder’s last performance against Luis Ortiz, where he was given a few headaches. This bout has changed the landscape. The winner of Fury-Wilder would have a completely different stance on the negotiating table for any bout with Anthony Joshua.